10. This session didn’t count, right? 9. 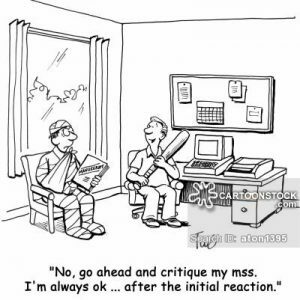 I’m going to warn you up front that I don’t take criticism well. 8. How many books should I expect to sell in the first week? 7. I’m not looking to hire a writing coach, I just wanted to send my manuscript to you to get your feedback. 6. I never realized how effective semi-colons are. 5. My writing group thinks you’re wrong. 4. How many copies of my book are you planning on buying for your friends? 3. What are your rates for writing college research papers? 2. Can you help me get my fan-fiction into Barnes and Nobles? 1. I’ve got the cover image done, now I just need to write the book. Can you think of any more? Leave a comment below. Have you become blind to the mistakes in your manuscript? Are you in that limbo of eternal editing without really getting anything done? Here are a few tips to break you out of that ongoing cycle. Oftentimes, we become blind to the errors in our stories because we’ve seen this vast collections of sentences so many times that we mentally fill-in what a section should say, rather than actually looking at the words in front of you. One way to deal with this is to make your story harder to read. Changing things like the color of the page or the font will force your brain to focus on the words in front of you and snap you out of that editing reverie. This can be tricky, as you run the risk of becoming so distracted that you can’t work. But if you can find the right combination of volume level and genre, you can achieve the same kind of results as the previous tip without additional eye strain. This is an old tip, but it works. Reading your story out loud can help with the flow of the narrative and the believability of the dialogue, among other things. Be careful of reading the story too fast however, as you can run the risk of seeing one thing but saying something else out loud. This method is best for when you’re trying to proofread your own work. If you read the story from back to front, it’s impossible to fall into the natural rhythm of the narrative, keeping you focused only on the words in front of you. I recommend taking it in paragraph-sized chunks, as anything smaller gets really tricky when going backwards. Whether it’s an editor, a beta reader, or just a friend looking over the manuscript, a second set of eyes may be your best way of dealing with your writer blindness. Just don’t rely solely on someone else to find and fix all your mistakes. This is your story, after all, and you should have the final stamp of approval on every line of it. These tips come from part four of my writing course “A Novel in Four Drafts”. If you’re interested in taking this class, registration is currently open to the public through the continuing education program at South Puget Sound Community College. The course begins June 22, so be sure to register soon.